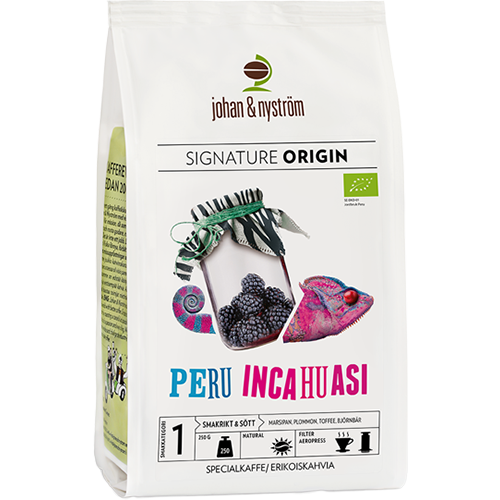 johan & nyström Peru Inchuasi coffee beans gives a fantastic coffee that offers ripe flavors of marzipan, plums, toffee and blackberries. In January 2015, Johan & Nyström initiated a close collaboration with Claudio, Jennie and their colleagues at the Incahuasi cooperative, which is a cooperative with a focus on sustainability, transparency and quality. The roastery was amazed by Peru's enormous potential. The high altitude, soil, precipitation and sun hours, few other countries have such optimal conditions for coffee cultivation. This is an organic coffee that really puts Peru on the map.